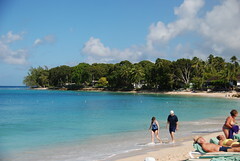 Calgary Herald "There's something about the first onslaught of prairie winter that triggers my Caribbean dreams, and there may be no better year than this one to explore an upscale isle like Barbados. Barbados definitely has loads of luxury (the only island with its own AAA and Zagat guides) but it's also one of the easiest for budget travel. There's a great infrastructure here -- a hangover from more than 300 years of British rule -- so you'll find clean, drinkable tap water and good local buses, along with excellent small hotels, many offering special discounts."